What is Paid Search, SEM & PPC? AdWords is a ‘paid search’ tool, which is essentially an advertising service, created and owned by Google that allows you to pay to reach audiences through different Google owned networks. This is a basic introduction to AdWords (the tool) but it also covers some fundamental concepts underpinning the whole subject of paid search. As mentioned, AdWords is an advertising service supported by a management console that allows users to buy traffic for their website. Combined with modern online tracking and analytics means that this is a powerful tool capable of delivering ROI (Return on Investment) strategies. In fact the potential implementations of AdWords vary as much as the needs of its users; From creating brand awareness to plugging holes in your conversion funnel with remarketing to direct response marketing. AdWords is a large and complex system with many moving parts all having an effect on each other and all requiring some degree of knowledge to manage effectively. The potential for mistakes among new users is very high, dabbling in an account without training or experience can be costly. At its most basic level, AdWords allows you to buy website traffic based on a wide range of criteria depending on how the account is structured and what features you wish to work with. AdWords should always be used with a specific goal in mind, without this measuring success if impossible even if measuring performance is done regularly. All of these terms are used interchangeably within Australia and the rest of the world to describe the discipline of paid online advertising. SEO is the flip side to this coin, commonly referred to as organic (or non-paid search). It is not possible to pay Google to appear within the blue section, this is only possible to do within the red section. 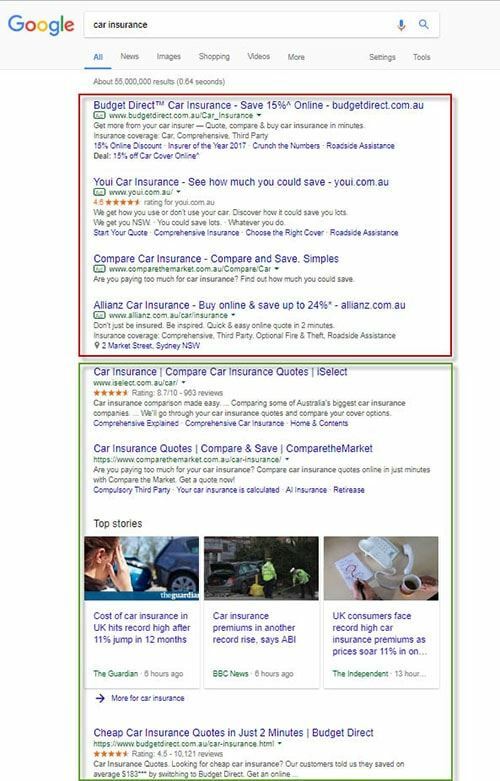 Clicking an ad within the red section will result in that company paying Google for the visit to their site. This is the essence of Google AdWords and paid Search, although may permutations of this model exist. As mentioned there are a huge range of implementations to suite the needs of online businesses and digital marketers. AdWords is a marketing channel and one that excels in attribution, meaning that at every level from top to the most granular you can track performance. This makes AdWords a very attractive service to people everywhere. We advise, if you are new to the subject and the tools used to manage an AdWords account, that you read through each of the guides provided before skipping ahead to more advanced sections.